As we pointed out on Tuesday, it’s pretty safe to say that All-Star closer Craig Kimbrel is likely to be playing elsewhere next season, and last night we learned that another bullpen piece is jumping ship as well. 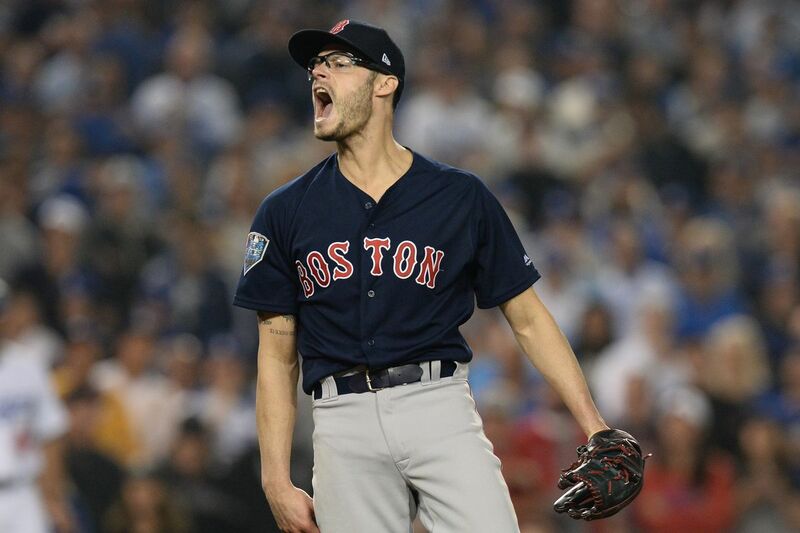 On Wednesday night, it was reported that setup man Joe Kelly will be joining the Los Angeles Dodgers on a three-year, $25 million deal. To be honest, I’m not all that upset, especially considering the amount of dough L.A. is doling out to the electric but all-too-erratic 30-year-old. While the guy has an absolutely lethal heater that can hit triple-digits and does own a respectable 3.87 career ERA, he did finish the 2018 regular season with a 4.39 mark and walked 4.4 batters per nine innings – numbers that are unacceptable for someone who was supposed to be one of the ones relied upon to hold the fort in the late innings before Kimbrel came in to shut the door. However, Kelly was then completely untouchable in the playoffs, allowing just one run in 11.1 frames with 13 strikeouts. Unlike Kimbrel, Kelly was probably one of the top reasons the Sox were even able to win the title this year due to his incredible postseason play. Seriously, this dude was absolutely DIALED IN two months ago. But again, inconsistency has always been Kelly’s most glaring issue – posting seasons with ERAs as low as 2.69 and others with ones above 4.50, including a 5.18 mark in 2016 – and maybe his performance this past October finally gave him the confidence he needed to pitch to his full potential going forward. But, with an already enormous payroll – one which the Sox are apparently focused on cutting significantly this offseason – it just didn’t make sense to take that risk at over $8 million per season. Thanks for everything, Joe, and I’ll never forget your magical October run. Best of luck out in La La Land. This entry was posted in Red Sox and tagged Boston Red Sox, Joe Kelly, MLB, MLB Free Agency, MLB Hot Stove, MLB Winter Meetings, Red Sox, Red Sox Free Agency, Red Sox Hot Stove, Red Sox Rumors, Sox, Sox Free Agency, Sox Hot Stove, Sox Rumors. Bookmark the permalink.